This service has been introduced in April 2011 (formerly named VAT Buster) and is targeted primarily to citizens of countries in European Union but can be successfully used in any country we ship to (check). Principle: What is the purpose of this service? SPLIT&SHIP is intended for our clients shopping for clothes and shoes with low price per piece. It's probably most forwarded commodity at all - kids clothing and shoes but also men's and women's apparel from megasales at Amazon, 6pm, Zappos and many other online stores. Important requirement: price of any piece in the shipment cannot exceed 22 EUR (approx. 30 USD), that is the official Duty Free limit for all members of European Union. In your favorite online store buy whatever you like and ship it at once into your Forwardo Mailbox. Ground shipping is usually free of charge, so you have saved on purchase and now we gonna save even on shipping and related expanses on the way home. Cool, then how do I prepare my shipment for SPLIT&SHIP? Shipment in your Mailbox must be prepared for SPLIT&SHIP, that way you will invest just little bit of time instead of your hard earned money. Go to detail of Inbound Shipment you want to convert to SPLIT&SHIP, scroll down to Additional Options and click of SPLIT&SHIP link. You are in SPLIT&SHIP form where you gonna setup as many microshipments as neccessary to ship all content Duty Free. Each microshipment can have different delivery address and will be declared separately. When you are done with splitting, close the shipment. Your job is done. All microshipments are shipped with USPS First Class Mail only. You cannot pick different carrier for SPLIT&SHIP. So what's the price and how much you can save me? Postage is based on prices for our least expensive carrier USPS First Class Mail. 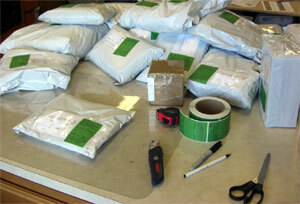 We will sum weight of all microshipments and charge you amount equal to postage for the total weight. Also fees for SPLIT&SHIP are based on our standard pricing, you pay $9.90 for standard forwarding and then $1 for each created microshipment, except for the first one. This fee covers packaging, customs form, global customs declaration, address stickers and actual work on splitting according to your instructions. There will be no VAT charge, no customs fees, no tax. Compare with shipment of whole package in one shipment via USPS PMI without insurance, postage charge would be $53.10. Total including forwarding fees $63. VAT and tax charged by customs is about $12, customs handling fee is $25. Total $100. You have just saved $34.62 using SPLIT&SHIP. And there is no weight increase after you split the shipment? Well, it might look unbelievable but it doesn't. The original box had some weight too and because the resulting microshipments are quite small we pack them into special tear-proof plastic bags made for shipping. That way we can save on weight because these bags weigh just couple of grams each. We have really thought about every detail. How long does it take for microshipments to get delivered? Delivery times are dependent on season and final destination. Approximate time of delivery in European Union is 7-14 days, in unfortunate cases this time can double. Shipments are delivered by your local post office. OMG, is there at least one disadvantage? Ofcourse such a service has even disadvantages. One of them is inability to track microshipments online, there is no tracking code on them and they are treated by your local post service as First-Class Mail. Another disadvantage is inability to insure microshipments because they are treated as First-Class Mail in the destination country and because there is no tracking available. Anyway, as you can see, the risk is minimized by splitting the original shipment into chunks with small value. And we have great experience with USPS First Class Mail, packages might be wondering little bit longer on the way but they are not getting lost. Isn't it against the law? That's the beauty of it. It isn't! You are not lowering value of the goods, you are sending only that much to fit into strict Duty Free limits for imports to your country. But remember: SPLIT&SHIP is intended for import of goods for personal use only! Note: SPLIT&SHIP can be used with any type of account and the charges are the same for all available account types. Not registered yet? Get you Forwardo Account Now, US mailbox is included free of charge!